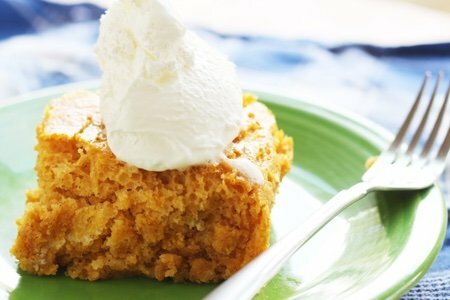 This pumpkin angel food cake recipe is great for the Weight Watchers’ crowd and the lazy crowd. I don’t believe there is a Weight Watchers’ lazy crowd because it is a ton of work to change your diet and lifestyle – hang in there, buddies! A slice of this cake is only 4 SmartPoints and takes just 3 ingredients (4 if you count water). The best part is that you will be using pumpkin spice which is very hip right about now. Every year, I go down the pumpkin spice path with a number of recipes. Last year, I shared pumpkin spiced muffins and a pumpkin spiced smoothie. It is fun to buy cans of pumpkin and dream about what you can do with them because pumpkin is inexpensive, low in calories, and is considered a fruit. Fruit is easy to work with as compared with let’s say – beets – which no one wants to eat. You can find the pumpkin in the baking section of your supermarket with the canned cherry and apple pie filling. I kept looking for it next to the other canned vegetables and fruit but, alas, it is considered a baking item. After doing this job since 2009, I could write a book about how to find ingredients in a grocery store. It seems like every time I go, I have to find something new and it drives me bonkers. It would be cool to have an app that would scan my terrible handwritten grocery list and then shows me which aisles and shelves my food is in. 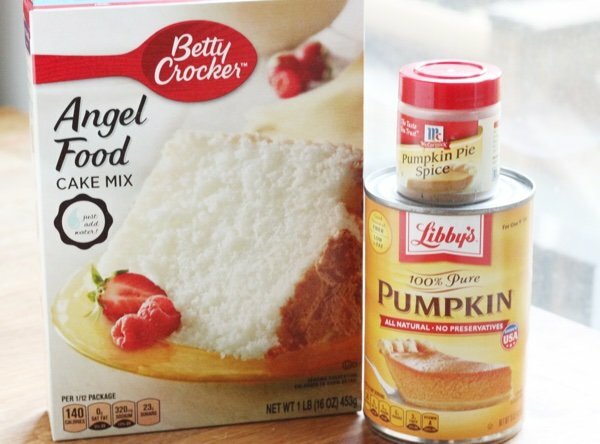 The pumpkin spice works in angel food cake because on its own angel food cake doesn’t have a lot of flavor. My kids LOVED this and I loved that it was only 92 calories for a slice. I thought this was great served with a little whipped cream and a coffee. Heat oven to 350 degrees and lightly grease a 9x13 glass baking dish. Beat the water into angel food cake mix for 1 minute using a whisk. Fold in pumpkin and pumpkin spice and spread in prepared dish. Bake for 20-25 minutes until the center has set. Cool completely before serving. This can be frozen. How did you figure this out? This will be a terrific replacement for some of the heavier desserts that appear at Thanksgiving. Think of the vitamin A!!!! @Jennie - any time you mix something with Angel Food Cake - you are going to get a lighter dessert because angel food cake is only egg whites and sugar. No butter, less flour, no yolks. Thanks for your question! Make sure you don't buy pumpkin pie FILLING. It drastically changes the stats and points (not in a good way). I have been making a similar recipe for years using Angel Food Cake mix and crushed pineapple. Delicious and I'm sure this one will be also. Going to a tea Sunday so this is what I will make and maybe surprise people! just a note to your comment about finding stuff in a grocery aisle? if you download the Walmart ap - type in what you want, and if you have a 'favorite' store listed, it will tell you what aisle it's in. Even if you don't shop at Walmart, you can use it to help identify what aisle it might be in at a different store? I'm pretty sure they all operate with the same basic business model, eh? Thanks for the great recipes! Def trying this one! I'm excited to make this too. This weekend I'll make it. Just so you know I am addicted to your no bake balls. I love the chocolate ones. Instead of 2 T water I use almond milk. Makes the texture smooth and creamy. I've also used wonder cocoa which is fat free and caffeine free, but you do have to use more al one milk dye to its drier texture. If you have Publix in your area you can create your shopping list on their website, pick your favorite store and it shows you what aisle the item is on. so excited to make this as my granddaughter loves anything pumpkin..The plus side is that it is so darn easy to make. This sounds delightful. I have one complication - i cannot have any gluten. Is there an easy work-around? Have you seen any gluten free angel food boxes by chance? thanks for all your creative ideas!! This looks delish Lisa, but I am puzzled by the instruction to grease the baking dish. Every Angel Food cake recipe I have ever seen warns against doing this as the cake will not rise up the sides of the pan. Perhaps this only applies to baking in a tube pan? Any thoughts? Yum! I'm all about the pumpkin spice. I've also made the cake using pineapple like Kris mentioned. I also made it using homemade applesauce. So easy and great flavor! Phyllis, I think the no grease is to let it rise up the walls of the tube pan but since this is made kind of like a sheet cake you don't have to worry about that? Thanks for the great idea Lisa! I am curious, can you use a traditional angel food cake pan or do the added ingredients make it so that it will not rise correctly? I use to make angel food cakes and will definitely be trying this! Thanks! A bunch of really good questions here! I did it in a casserole pan and didn't grease it - and it stuck like crazy. I think you need to grease it because you are significantly changing it with the pumpkin. I am not sure if it would work in an angel food cake pan - it is quite a bit more volume than a regular angel food cake. Has anyone tried it? to make per recipe. I froze the cake mix, that I had to take 2 ounces out of mix. My family loved the cake. I have used pumpkin in Chocolate cake before too. 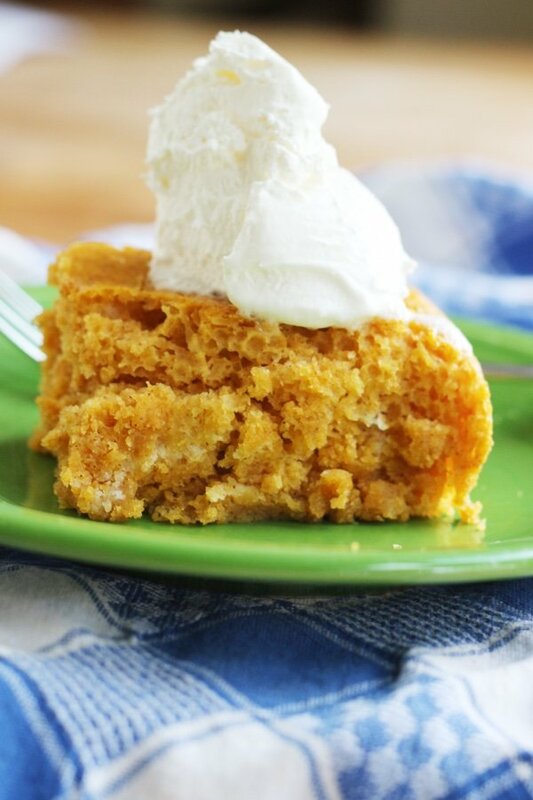 You can't taste the pumpkin but it makes a very moist cake and I learned this from Weight Watchers. Looks like an easy breezy cake to make. Can't wait to start. I wonder if I could do this with a made from scratch angel food cake. Where would you find an 18oz box of angel food cake mix?